ERR has learned that the Estonian Financial Supervisory Authority (FSA) has issued a precept which requires the Estonian branch of Danske Bank to close. The Tallinn branch of Danske, a Danish-owned bank, has been at the centre of a money laundering scandal. Around €200 billion in potentially illicit funds, principally from the Russian Federation and other former Soviet nations, is thought to have passed through the branch between 2007 and 2015. The story came to light through the course of 2018, causing Danske chief Thomas Borgen to resign, and the arrest of 10 Danske Estonia employees and former employees. The closure of Versobank after its breach of anti-money laundering rules will have very little impact on the Estonian economy and banking as Versobank had only a marginal market share and the majority of the deposits in the bank are owned by non-residents. Deputy Governor of Eesti Pank Madis Müller said that Versobank, which was closed for persistent breaches of anti-money laundering rules, was not a systemically important bank for Estonia. “The Estonian banking sector as a whole is stable and strong. The closure of Versobank shows that oversight of Estonian banks is effective and Estonia will not tolerate breaches of anti-money laundering rules”. Versobank had a marginal share of the market and mainly handled services for clients from outside Estonia. At the end of last year, clients had around 253 million euros of deposits in Versobank, which is equal to only 1.5% of all the deposits in banks operating in Estonia. Of the deposits in Versobank, 87% were held by non-residents. “Before the operating licence was withdrawn from Versobank, the Financial Supervision Authority carried out on-site inspections four times since 2015 and wrote an injunction requiring shortcomings to be eliminated. The closure of Versobank is a message that there is no place for money laundering in Estonian banking”, said Mr Müller, who is also a member of the supervisory board of the Financial Supervision Authority. Suspicions about money laundering have touched banks operating in Estonia and Latvia in recent years. The Financial Supervision Authority uncovered serious shortcomings at the Estonian branch of Danske Bank in 2014 and wrote an injunction in 2015 requiring them to be eliminated. Danske responded to this by closing its problematic business lines aimed at risky non-resident clients. An additional independent enquiry has now been opened at the head office level of Danske Bank looking at banking transactions in the whole period from 2007 to 2015. The third largest bank in Latvia, ABLV, also came under suspicion of money laundering recently and the liquidation of the bank was initiated at the end of February this year. Deposits of non-resident companies and household clients in the Baltic states are largest in Latvian banks and smallest in Lithuania. At the peak in 2014, 56% of all the deposits in Latvian banks were deposits of non-residents. This share had fallen to 41% by 2017. The share of non-resident deposits in bank deposits in Lithuania is only 2.8%. The share of deposits in Estonia held by foreign non-financial sector companies and households has been declining steadily, and it fell from a peak of 21% in 2012 to 8.5% by 2017. More information about compensation of the deposits of Versobank clients and the liquidation of the bank can be found on the website of the Financial Supervision Authority. An analysis by the National Audit Office indicates that a lot of state-owned companies don’t deal with the prevention of corruption systematically. This above all points to deficiencies in the work of their supervisory boards, the office finds. The analysis revealed that many of state-owned companies have not established the internal guidelines required for the prevention of corruption, and that the assessment of corruption risks and raising employees’ awareness should be given more attention. Most companies have not made it possible for employees to report suspicions of corruption anonymously or determined an action plan that would explain how to behave in such a situation, including informing law enforcement and the general public. Also, a lot of the companies haven’t established conditions for the giving and receiving of gifts. Still, they predominantly see measures against corruption as necessary, and ministries that manage corporations as well as public works are already applying best practices for the prevention of corruption. According to Marek Helm, Director General of ETCB, this is the biggest investment in the history of ETCB, which enables the customs to streamline customs checks for traders. ‘With x-ray technology five minutes and one scanned image is enough to make a decision on the need for a first-level control. Physical examination, by contrast, would take several hours including loading and unloading,’ Mr Helm explained. ‘The experience so far related to the existing x-ray equipment has shown that this is the most efficient solution for the inspection of goods traffic and detection of illicit goods. According to Estonian and other states’ experience border crossing points where such technology is not used have proved to be the preferred checkpoints for smugglers,’ Mr Helm said. By the end of next year it is planned to install fixed x-ray units at Narva railway station and Luhamaa and Koidula border crossing points. Two mobile x-ray units will presumably be completed by the second half of 2017 and used at Narva road border crossing point, the ports of Sillamäe and Tallinn and border crossing points between Latvia and Estonia. The biggest smuggling case detected with the help of x-ray scanner was in Paldiski in 2015 resulting in a seizure of 7, 7 million illicit cigarettes (1.3 mln euro loss of tax revenues). ETCB concluded the procurement contract with the European branch of the Chinese company, Nuctech Warsaw Company Limited, based in Poland. The value of the procurement contract is 10.1 mln euros plus VAT of 2 mln euros. The purchase of the equipment is financed from the European Cohesion Fund in the amount of 2.55 mln euros, and from the state budget in the amount of 9.57 mln euros. The Internal Security Service KAPO on Sept.22, 2015 detained Tallinn Mayor Edgar Savisaar as a suspect for repeatedly accepting bribes. The Center Party chairman is suspected of repeatedly accepting bribes in 2014 and 2015 in assets and favors for himself as well as for a third party with a total value of several hundred thousand euros. A report released by the European Central Bank shows that bank card fraud in the the Single Euro Payments Area (SEPA) affected 11.3 million transactions worth a total of 1.4 billion euros in 2013, the highest figures for the past five years. The total value of the transactions affected was 8% higher than a year earlier, and the number of cases of fraud was 25% higher. The frauds mainly occurred over the internet, where online trading is used increasingly. There were five cases of bank card fraud in Estonia for every 1000 residents of the country, with the loss in each case averaging 150 euros. In the SEPA as a whole there were 20 fraud cases per 1000 residents, while the rate was highest in the UK at 68 cases per 1000 residents. Cases of bank card fraud using cards issued in Estonia continue to account for a small share of card transactions, and there were 6200 cases in 2013 with a total value of 950,000 euros. During that same year, 287 million card transactions were made, with a total value of 9 billion euros. The total value of card fraud increased by 8%, and the number of cases increased somewhat faster, but this is in line with the higher incidence of card payments, the total value of which rose by around 8%. 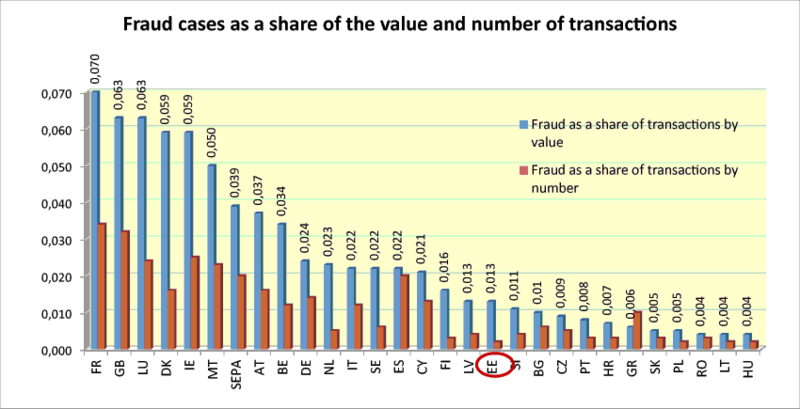 Fraudulent transactions accounted for 0.013% of total value, which is one third of the SEPA average, and 0.002% of all transactions, which is one tenth of the SEPA average. Card fraud is generally less common in countries like Bulgaria and Croatia where card payments are used less, but Estonia and Finland stand out for having high rates of card usage and low rates of fraud. Card fraud in Europe mainly occurs with payments initiated over the internet. Fraud worth 1.4 billion euros was committed using cards issued in Europe, of which 66% or 958 million euros was internet fraud, 20% or 289 million euros was fraud at card payment terminals, and 14% or 202 million euros was fraud involving ATMs. The value of card fraud committed over the internet was one fifth larger in 2013 than in 2012, while the value of fraud at ATMs was 14% lower and fraud at payment terminals was 18% down. Improved security measures have helped combat fraud at ATMs and card terminals, with chip-based technology that is hard to forge becoming more widespread in cards and terminals, and skimming device detectors being used. Estonia differs from other European countries in its low level of internet-based fraud. Fraudulent online card transactions worth 390,000 euros were made in 2013, which is one quarter of the amount elsewhere in Europe in the SEPA. Frauds at ATMs and payment terminals caused losses of 560,000 euros. Online fraud may have been low because Estonians do little shopping online, and also because of the 3D Secure card payment security procedures used by Estonian banks. These procedures require card holders making payments online to enter additional security data, making it harder for anyone else to use the card fraudulently. It is important to remember when shopping online that purchases are only secure if the online merchant also uses this security procedure. 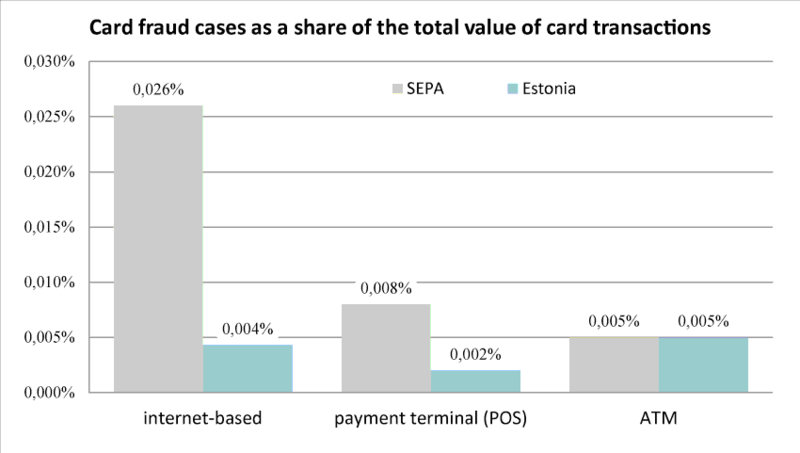 While there are few fraud cases involving cards issued in Estonia online or at payment terminals, the value of fraud at ATMs as a share of the total value of card transactions is about the same as the SEPA average. Most of this card fraud occurs outside Europe. ATMs in Estonia are secure because of their chip-based technology, and few frauds are committed within the country. The crime rate in Estonia continues to show a sharp decline which however can be partly attributed to Penal Code changes that stepped into effect at the beginning of the year. In the first five months of the year a total of 13,252 criminal offenses were registered, 2,879 fewer than the year before, which makes a year-on-year drop of 18 percent. At the same time the number of thefts and frauds fell even more sharply, by 31 percent and 40 percent, respectively. Registered thefts numbered 4,594 and frauds 614, respectively 2,019 and 412 fewer than during the same period last year. The head of the analysis unit at the Justice Ministry, Jako Salla, explained that the review of the Penal Code affected mainly the number of criminal offenses against property such as theft and fraud primarily because the criminal limit was raised from 64 to 200 euros. Robberies numbered 157 in the five months, four less than a year earlier. The number of traffic offenses on the other hand soared 21 percent, from 1,298 to 1,570. This too was connected with the amendment of the Penal Code, Salla said. There was little change in the number of cases of physical abuse, with 2,246 cases registered in January-May 2014 and 2,298 this year. A marked drop has occurred in manslaughters and murders, of which 20 were registered in the first five months of last year and 15 this year. The statistics include also attempted homicides. Growth has been recorded in registered cases of serious damage to health (from 27 in 2014 to 39 this year), threats (from 268 to 297) and rapes (from 59 to 77). A slight increase was observed also in drug-related crimes. Unlawful handling of large quantities of narcotics grew to 453 cases from 395 registered last year and handling of small quantities of drugs increased from 43 to 46.